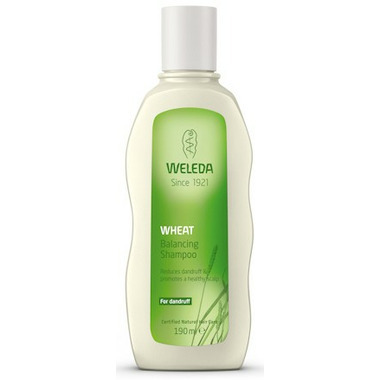 Weleda's Wheat Balancing Shampoo with wheat germ oil treats dandruff by restoring balance and wellbeing to the scalp, roots and hair. The best shampoo I ever used was Infusium 23, bought by Clairol and changed to just another ho hum shampoo. Then I tried this one. Just about the same quality. I really love it, and it doesn't have an overly perfumed scent. Nice clean scent. Great to remove build up. Used with the oat conditioner it has helped my post-partum ultra dry hair! Great shampoo, to use with the oat conditioner ! I have thinning hair so any oils weigh it down, but this leaves my hair moisturized and not oily. I began having multiple chemical sensitivites and allergies in the past couple years. Reactions to many, many shampoos, tried almost every "organic" and "natural" brand going. This shampoo was the first that didn't cause any problem. It works fine, has no synthetic preservatives. I love it! I have silver-white hair which tends to be a bit on the dry side. I can go for four days or so without washing, without my hair looking greasy. This shampoo gets it clean, all right, but it removes the little oil that my hair does have, so that the result is clean hair that looks dry and bleached out. I think it should be designated as being for OILY hair. Also, it has a strong and, I find, unpleasant smell. The price isn't very appealing, either. Not bad, hair feels cleaner without build-up. Small bottle, so probably won't purchase again due to high price. This product was a bit of a bust for me. First of all - did't realize how small the bottle was going to be - considering the price, it is a bit much. Also, originally bought the product for my daughter who was having some build-up in her hair but she refused to use it due to the strong smell. My husband has it now.